The holidays are upon us, which are an amazing time filled with lights, and cheer, and family & friends, and perfect gifts to celebrate the one's you love, and stress, and obligation, and stress. And did we mention stress? Hectic lives are made even more hectic with the crush of commitments to make the perfect holiday. 14 teacher gifts, 8 neighbor gifts, 20 co-worker gifts, cookies to bake, evenings filled with battling it out with fellow merry-makers for the perfect present, rushing from work to holiday gatherings, all while still trying to find some time to revel in the reason for the season and share with those who are less fortunate (hopefully). Well, it's enough to make anyone crack. 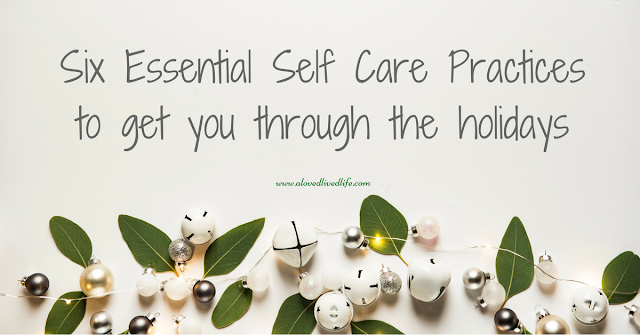 Remember in this season of giving, that's you "can't pour from an empty cup" and it's essential to give to yourself with self care. If you don't make time to take care of you, you may look up and discover you missed the moments of wonder in the holidays. Staggering into January, exhausted, you still have three months of winter to look forward to, putting away all those festive decorations, and a mountainous credit card bill. The time to find balance is now! You don't need to have a grand reason or conflicting arrangements already made to justify saying no to a holiday obligation. If you say yes to everything asked of you during the holiday you may be busy from dawn to midnight every day of December, which leaves no time to enjoy the season. It may be saying no to a party invite, a new project, the opportunity to hand knit socks for the homeless, or, equally important, no to your own impossible expectations. Sure, it might be nice to work with the kiddos to hand craft teacher gifts, but $1 boxes of mini-chocolates will get the job done and free up an evening that might otherwise end in tears. "I'm busy enough; I don't have time to meditate," you might think. But seriously, mindfulness mediation has been proven to decrease stress and increase happiness. Left to it's own devices brains are constantly dwelling in the past or racing toward the future. Activities are conducted thinking about what we need to do next. Practicing mindfulness meditation helps you hone the skill of acknowledging your thoughts and releasing them, which can help you exist in the moment so you can relish those moments with loved one's instead of skipping over their smiles as you race to the next thing. Now is as good a time as any to create a morning routine that fills your cup. Starting your day off right provides the foundation for a good day. What does your ideal morning look like? Is it getting up early for a morning run? Rolling out of bed and onto a yoga mat? A few quiet minutes with your partner enjoying a cup of coffee? Meditation? Setting an intention for the day? Journaling? Praying? What is the thing that you need to put you in the right mindset for the day? Once you've determined that, figure out how to build in the time you need in the morning to give yourself that strong start for a good day. The flip side of the holiday coin is how everything fizzles out in January. Exhausted and spent out, the holidays end and there's nothing to look forward to but the credit card bill. As a way to reduce your obligation load and give yourself something to look forward to, shift some of your holiday plans into the new year. Maybe you host your appetizer party in January. Or a cook-off for most creative use for leftovers. Maybe you send New Year letters, instead of Christmas cards. Maybe you create a new tradition such as, closet clean out party (I am a huge fan of organizing, so this would be fun for me, some of you might have gotten chills reading those words, find what works for you), gratitude letters for why you appreciate the person who gave you a gift instead of standard thank you cards, crafting parties where you reinvent leftover items from the holidays, etc. The holidays are rife with cookies, candies, potlucks, parties, festive cocktails, etc. Saying no altogether can lead to feelings of resentment and depression and then a boomerang of overeating. Conversely, throwing caution to the wind and eating whatever you want at every turn can lead to some serious regret and self-loathing when you climb on the scale in January. Instead, practice moderation. Find a balance. When you go to a party, scan the offerings and choose one indulgence or bite sized portions of several. Enjoy a taste of the season, but stick with one cookie instead of ten or a few bites of pie instead of a full serving. A loved lived life is about balance. It may seem counter intuitive and you may be thinking that you don't have the energy for exercise with all your other obligations, but getting some regular exercise will keep your energy levels up and fight off those extra calories ubiquitous around the holidays. Hopefully there's a type of exercise that brings your some joy, such as a walk around the block with a loved one after a meal, or at the very least things you don't hate. If going to the gym would be Dante's third ring for you, then don't do that, but maybe you enjoy listening to an audio book on the elliptical at home or jamming out to music at a dance class. Find what works for you and make time for it. You deserve it. Hopefully these few quick and easy routines will help you have a loved lived holiday this festive season! If you have tips that work for you, please share them below!